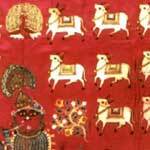 As Pichhwai’s and religious hangings, textiles play an important part in the Hindu religious observations. Used as wall paintings or decorations, a backdrop for the diety, carried around to decorate a portable shrine, or even the garments worn by the priests, many had verses of the scriptures or the gods name woven in the designs and borders. There are also canopies, curtains, carpets and prayer rugs. The TAPI collection has representatives of all categories, be they embroidered, painted, or printed religious hangings. There are also examples of ‘folk’ variety, items made for individual use.